Arugula: This is sown in early spring or fall. This salad crop prefers cool temperatures. Enjoy its unique, peppery taste alone or in a salad of mixed greens. Asparagus: Asparagus is a perennial vegetable, taking two or three years to become established, and lives for 20 to 30 years. It requires minimal care and produces sweet, tender stalks every spring. We planted asparagus in 2017 and expect to harvest some in 2020. Basil: Basil and tomatoes go together in the garden and the kitchen. Basil has a strong flavor and is best used fresh. We love to make basil pesto and freeze it. We plant basil in our hoop-house with the eggplants and peppers. Beets: Beets take up little room and can be planted in early spring for a summer harvest or late summer for a fall harvest. Bok Choi: This crisp, flavorful cabbage is used primarily in stir fries. It thrives in cool, moist conditions and tolerates part shade. Broccoli: Broccoli is a cool-season crop that tolerates late spring frosts. Fresh broccoli tastes infinitely better than commercially-produced counterparts. We cut stalks off the main plant for a continual harvest. Brussels sprouts: Brussels sprouts need a very long season to grow—as much as 175 to 185 days, depending on the variety. The taste is actually improved by a touch of frost. Cabbage: We grow many different kinds of cabbage, green and red, smooth and curled, fresh eating and storage varieties. Cantaloupe: The sweet fragrance of ripening cantaloupe in the garden is reason enough to grow it, but the sweet taste is even better. Carrots: Carrots can be tricky to germinate in our dry soil conditions, but they take up little room and are easy to grow. Our sandy soil allows us to grow long rooted varieties. We try to grow some sweet varieties for summer, and good storage for over wintering. Cauliflower: Cauliflower is a bit trickier to grow than some of the other brassicas. It doesn’t tolerate heat or frost, but needs at least two to three months to mature. We typically only grow it in the fall. Celeriac & Celery: It grows slowly, requiring as much as six months to mature, and prefers a cool, moist climate and very rich, wet soil. It doesn't always work out for us. Cilantro: A strong flavored herb for fresh eating. Goes great in salsa. Cucumber: Cucumbers thrive in warm, moist conditions. We have great success in our hoop-house by trellising them. Dill: Dill grows easily from seed, is delicious in a variety of dishes and attracts beneficial insects to the garden with its tiny flowers. Eggplant: Those shiny, purple lobes are the royalty of any garden. We grow eggplant similarly to tomatoes in our hoop-house. Fennel: Eat the bulbs or tops fresh or cooked. Has the flavor of anise. Garlic: Plant garlic in the fall and harvest in the early summer. We save our bulbs each year and plant our own stock. 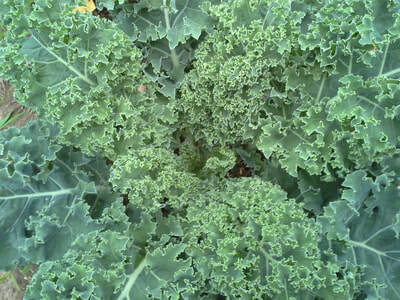 Kale: Kale is a cool season vegetable that we plant first thing in the season and keep going until it freezes. We typically harvest leaves before and after the hot summer since higher temperatures make the leaves bitter. 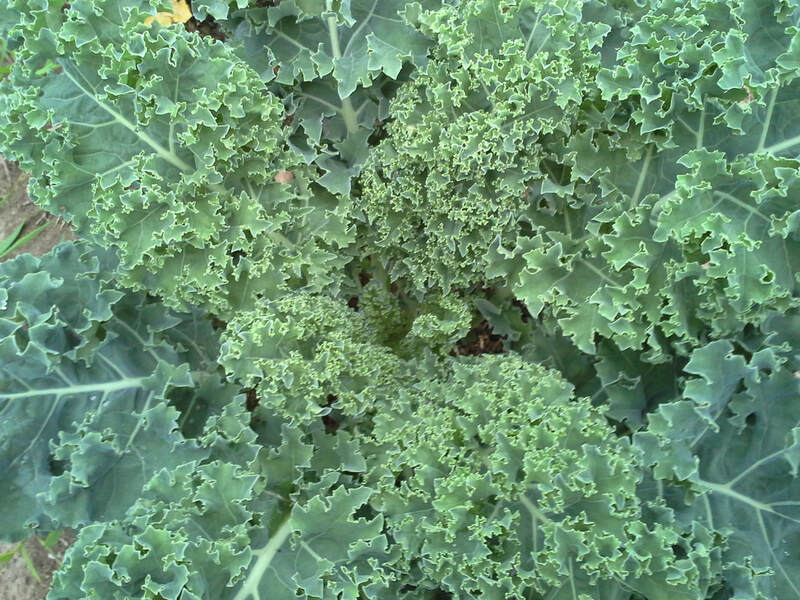 Kale is rich in vitamin A and vitamin C, making it a great vegetable for nutrition. Kohlrabi: We plant kohlrabi in early spring and again in the fall. The plant produces a turnip-flavored root that is good for fresh eating. Leeks: Leeks are mild-flavored cousins to onions. They have a long growing period, and are usually harvested in the fall. Lettuce: We start lettuce as early as we can and plant it continually throughout the season. We grow heads and baby leaf. Nasturtiums: This is an edible flower, you can eat the leaves and the flowers. Both are a little bit peppery. Onions: Onions take a long time to grow from seed, but we have found that starting our own has better results than buying them elsewhere. We grow yellow, red and green onions (scallions) and offer them all season long. Parsnip: Parsnips look like white carrots, but have a texture closer to potatoes. Use these root vegetables in soups, stews or roasted. Like carrots, they are slow to germinate. They benefit from a few frosts. Parsley: Flat leaved bright green herb adds color and mild flavor to any dish. Grows all season. Peppers: We grow many different varieties of sweet and hot peppers. Peppers need a warm location and moist soil to develop the thick-walled, sweet fruit. We grow them outside in the field and also in our hoop-house. Potatoes: This staple crop is drought-resistant and yields more protein per square foot than any other crop but legumes. We buy new potato seed each year as a precaution against disease. 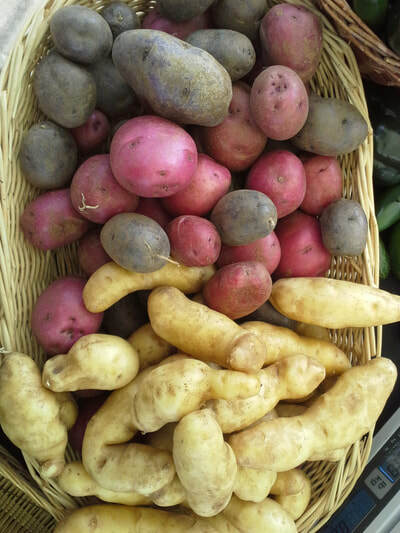 We grow 8-10 varieties of potatoes each year. Pumpkins: Pumpkins take up a lot of space in the garden with their long, lazy vines, but their cheerful, orange or white fruit are worth the space. Radish: Radishes germinate quickly, take up little space and reach maturity in four to six weeks. They are best eaten fresh. Rhubarb: This old-fashioned perennial plant is actually a vegetable, but is eaten as a fruit. Rosemary: This is a tender perennial herb that grows in our greenhouse. 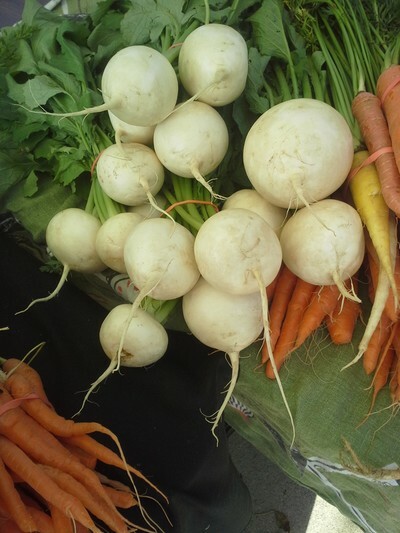 Rutabagas: Rutabagas are round, squat root vegetables that are typically eaten boiled, or mashed and served with butter. These humble vegetables thrive in cool temperatures, but require at least three months to mature. Sage: We grow culinary sage which pairs well with fall flavors, and white sage, which is much more fragrant and used for burning as incense. Scallions: Green topped onions for soups salads, tacos or anything really. Snap peas: Snap and snow peas have crisp edible pods, eaten fresh or used in stir-fry. These plants are just as easy to grow as garden peas. Plant them in early spring for a late spring crop. Spinach: Delicious in salads or steamed, spinach is one of the earliest garden greens. It goes to seed as soon as temperatures spike. Summer squash: Summer squash includes yellow squash, zucchini and patty pan squash. These plants grow easily and are prolific producers. They are susceptible to disease so we often will have two plantings. Sweet potatoes: Sweet potatoes need at least five months of warm weather, making them a popular crop for Southern gardeners. Tomatillo: The plants resemble tomatoes. The green fruit develop a papery skin when they are ripe and can store well in a dark cool pantry. Use them for sauces. Tomatoes: Tomatoes are the most commonly grown garden vegetable, and with good reason. Home-grown tomatoes are infinitely better than those found in the grocery store. 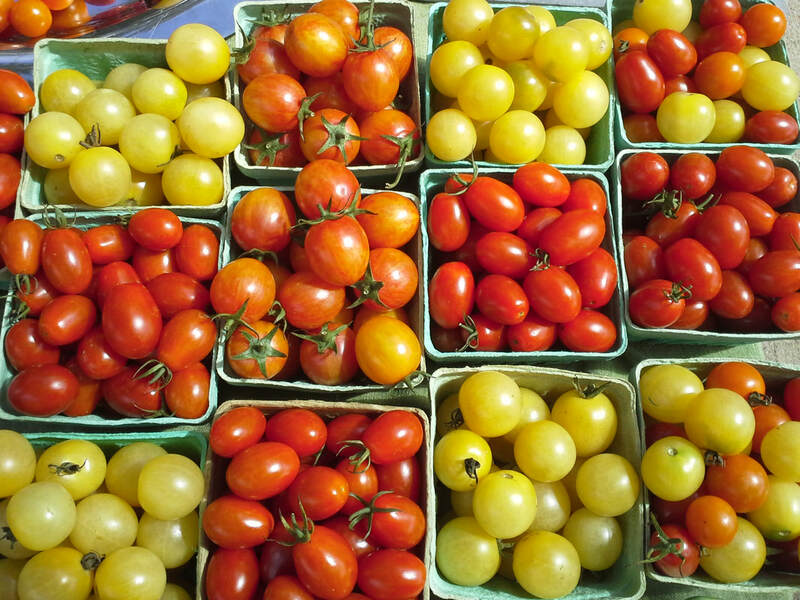 We plant a large variety of hierlooms and hybrid tomatoes in our fields and hoop-house. 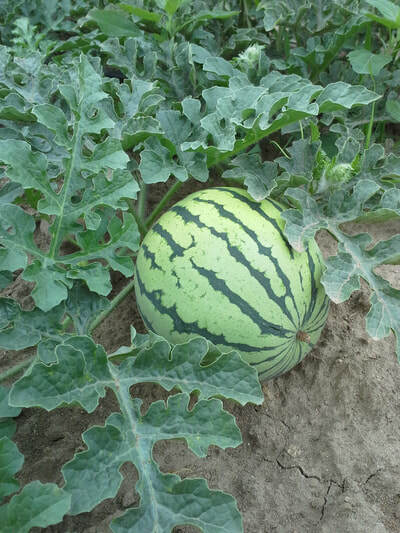 Watermelon: Watermelons need long, hot summers and plenty of water to mature. 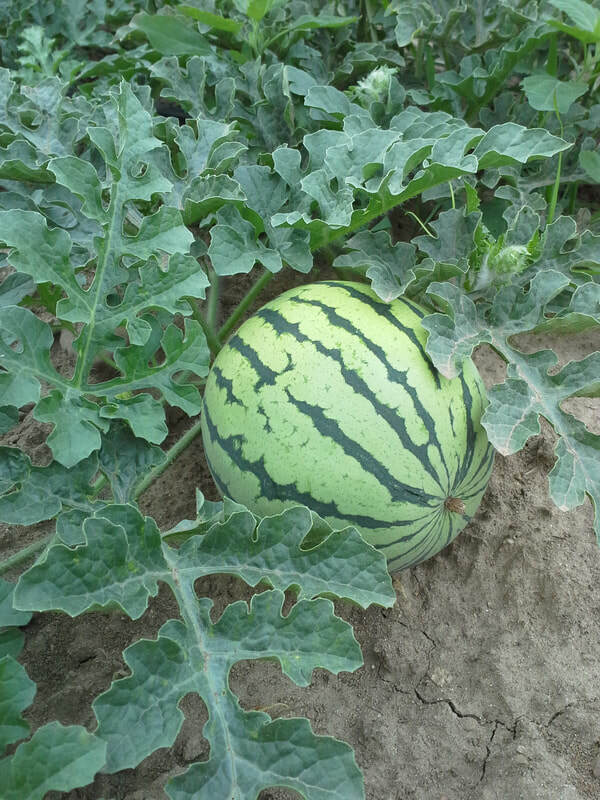 We grow 5-6 different melons each year of different colors and sizes. All of our varieties have seeds, because they have the best flavor. 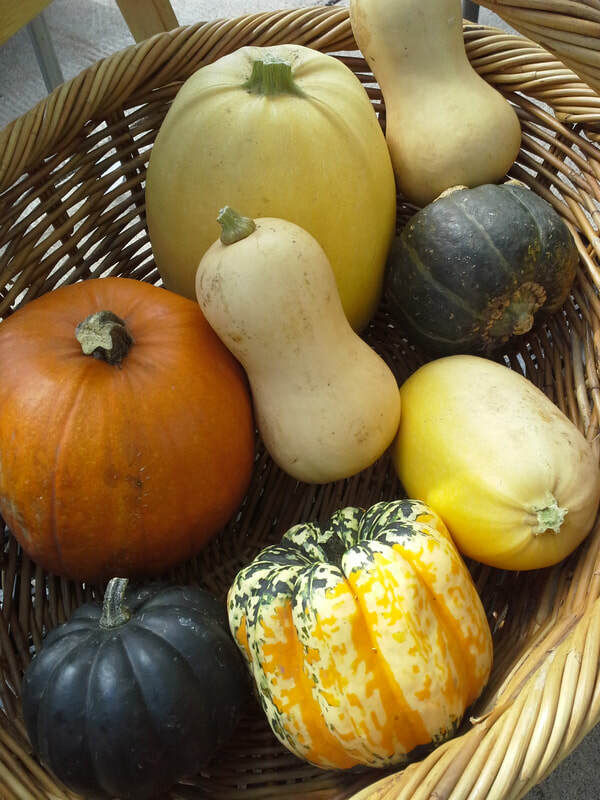 Winter squash: Winter squash, such as acorn and butternut squash, take up more room in the garden than summer squash and require more time to mature. However, they store well and have a high vitamin content. We grow many different varieties. Zucchini: Zucchini is actually a specific type of summer squash, so it is grown using the same methods as summer squash. We pick our zucchinis small and tender. Sometimes we get large ones that hide in the leaves, and if you want to make zucchini bread these ones are preferred.